Many telcos have a large installed base of ATM DSLAMs but have a requirement to make use of their Ethernet backbone networks while the ATM core networks are being run down or decommissioned. The lifetime of the existing DSLAMs can be extended by converting between ATM and Ethernet at the trunk side of the DSLAM. 2. 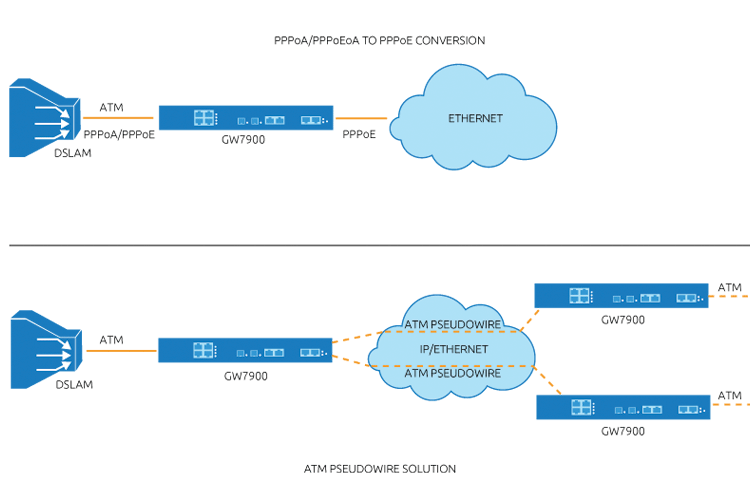 Terminating the ATM in the GW7900 and converting between PPPoA and PPPoE, or PPPoEoA and PPPoE. The GW7900 has several interface options with either dual/quad OC-3/STM-1 WAN interface or a single OC-12/STM-4 interface.